I’ve wanted to go glamping ever since I heard about it several years ago. Don’t get me wrong, I love traditional camping, but glamping sounds like an amazing, unique and fun way to enjoy the outdoors while still having all of the comforts from home at your fingertips! 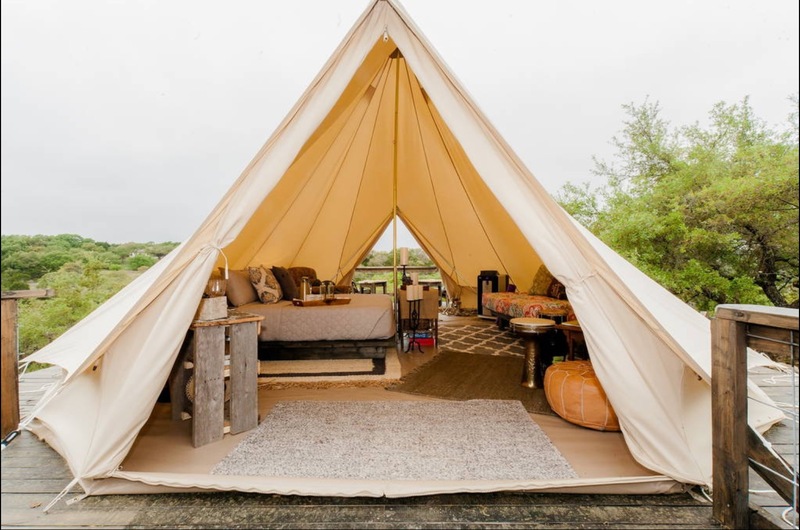 You see, glamping is defined as “glamorous camping,” or camping with amenities, and in most cases, pretty extreme amenities! In fact, Scott and I even talked about going glamping in Wyoming for our ten year anniversary last summer. Alas, Ty Baby was due (and born) mid-summer last year so it just never happened. Fast forward to about 20 days ago when Facebook suggested that I like The Texas Bell. 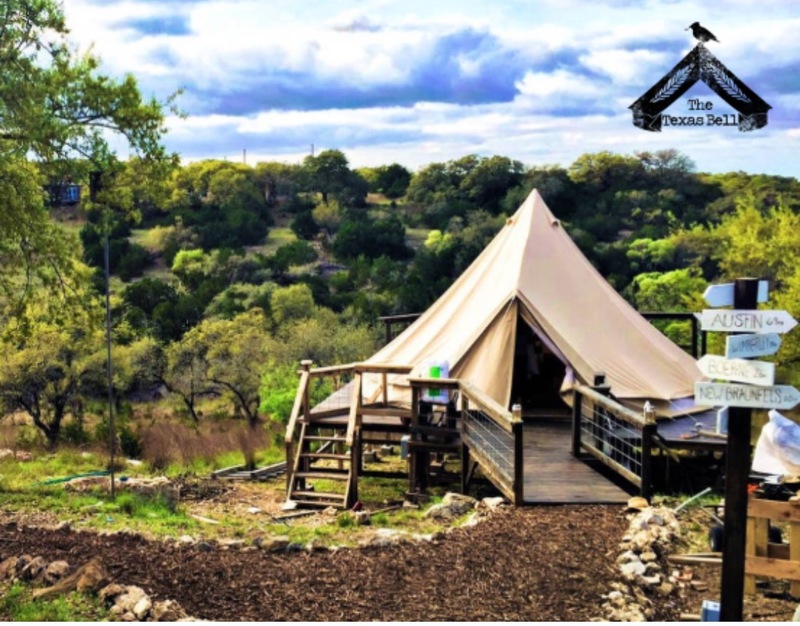 Upon realizing that it was a glamping operation, I of course I clicked “Like” and then, much to my excitement, I discovered that not only is it close to us, but it looked amazing, was brand new (opened April 1, 2016 I think), very reasonably priced, and had availability! Throw in the fact that the “big kids” have been begging to camp for weeks now, and I just had to book it! So Scott and I overnighted with all of our little people (ages 3.5 years, 2 years and 10 months) which now that I think about it, I’m not sure we’ve done very often if at all! As I mentioned earlier, Landri and Rex have been talking about camping for quite some time now so they were extremely excited to go on this adventure and enjoyed every second of it! There are so many wonderful things to share about the property, hosts and our experience that I honestly don’t even know where to start so I’ll begin by sharing what I think sets The Texas Bell apart from other bed and breakfast experiences that we’ve had. Aside from it being a luxury tent, the level of customization for our family’s stay was truly incredible. Leslie and Jess, the wonderful husband and wife team that own and operate The Bell, make it their mission to ensure that their guests have the perfect stay. In our case, this meant accommodating our kiddos, my meal preference (vegan) and even catering to my recent wrist injury! Incredible! For the kids, they set up a small children’s picnic table next to our grown up table, set out various fun toys for all three of our kids, had a pack n play for Ty and even a high chair for him if we needed it! We appreciated the detail so much and of course the kids loved it and really felt at home. Additionally, although I didn’t even request it, Leslie noticed that I’m vegan (on my blog I assume), and prepared the most amazing and nutritious (vegan) nut, seed and berry parfait for the grownups’ breakfast! Talk about service – and a fabulous surprise for me! It was incredibly delicious – even Scott loved it, which he’s the first to admit, isn’t always the case when it comes to my preferred (vegan) cuisine. So yes, included in your stay is breakfast and you can pretty much choose anything under the sun. For the kids, we all agreed the kids would love Jess’ world famous French Toast (which they did – and I did too – I had to taste it, it looked so delightful)! Again, customizing for the kids, they were served on kid plates at their mini kid table with sippy cups of fresh squeezed orange juice (which we got too, along with coffee and glass bottled water – another cool theme that you’ll notice at The Bell, sustainability – even the tent platform is made of reclaimed wood!). So whether you’re a family of five with three small children, or a retired couple passing through on your tour of Texas, Leslie and Jess will no doubt find a way to customize your stay as well, making it as memorable as possible! And because the tent is in the backyard of Jess and Leslie’s gated private residence, not only is it secure, but you have access to a large portion of their gorgeous home including their well equipped kitchen and according to Scott, one of the most bad@$$ grills he’s ever used, again allowing for more customization for what you dream your weekend to entail. And just in case cooking isn’t what you had in mind for a weekend of pampering, there are plenty of great local options nearby that can meet your needs! Your hosts know the area well and can recommend activities, restaurants, shopping, etc. for the out of town guests. Also, just a related side note, Leslie, who does the booking, is extremely responsive to inquires and is also very flexible. We had torrential storms during our first booking date and she worked with us to reschedule it! Okay I’ve spent enough time not talking about how beautiful the tent is! As you can see in the photos, it definitely isn’t your average Coleman camping experience! Again, no detail is spared when it comes to the tent’s interior. Not only is it outfitted with the most beautiful textiles and rustic-chic decor and accents, but it is extremely comfortable as well. Upon reclining into bed, Scott and I both agreed that it was more comfortable than our expensive Tempurpedic mattress at home! The tent is also outfitted with not only AC/heat and electricity, but it even has its own wifi! Leslie and Jess have thought of everything, including a flashlight, bottle opener, and a corkscrew! Photos and video don’t even begin to convey how awesome it is – you need to just see for yourself in person, but here’s my quick video attempt. So what do you do when you’re Glamping? Ummmm…relax!!! Or you can enjoy any of the many relaxing things to do while there! You can swing in the custom swinging chairs built by Jess (see below), play tic tac toe or checkers on the back porch of the tent overlooking the most tremendous hill country view, check out the games and books inside the tent, enjoy a cold beverage at the shaded picnic table with built in ice troughs to keep drinks cool while listening to the sounds of nature or the portable Bose speaker, watch the chickens peck the ground (yes they have free ranging chickens and fresh eggs! ), relax on the gorgeous patio of the main house or feed the fish in the koi pond! Oh! And depending on whether or not there’s a burn ban, you can even make a traditional campfire! I regret not bringing the fixings for S’mores although the non vegan pie Scott made in the Dutch oven was delicious, haha! 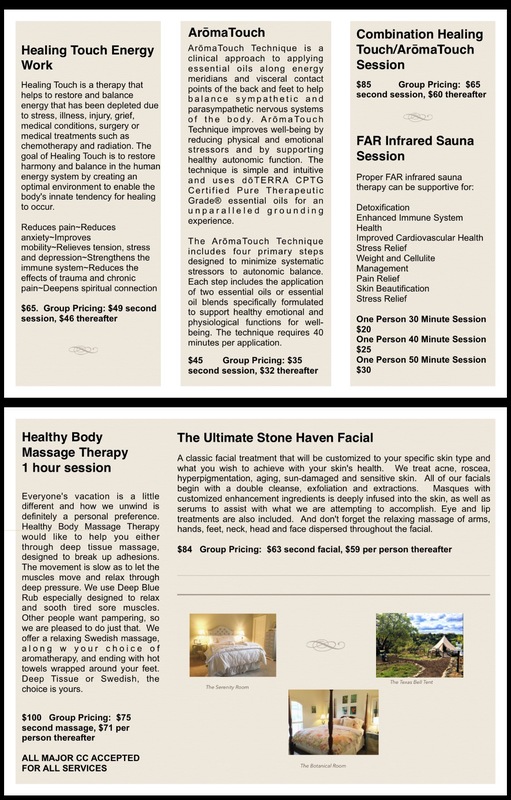 My only regret was not being able to enjoy Leslie’s Healing Room and any of her (what I’m sure are amazing) treatments and sauna (too tricky with three kiddos ages three and under) – so I’m saving that for another time! I’ve even thought about going solo for a meditation weekend alone in peace and quiet! You know, just like how Scott goes hunting! I’ll go glamping! In all seriousness though, it was a blast. We made great memories and I cannot wait to return – no matter what capacity, kids or not, and to watch The Bell grow and evolve over time (for example, Jess is currently constructing an outhouse including an outdoor shower- one of my favorite things in the world – and no worries, right now you just use the main house for the next week or so until it’s complete)! It’s kind of funny. I’ve always told Scott that I would love to one day buy a big piece of property and run a Bed & Breakfast. I like the idea of a unique vacation experience and the small touches that bring unusual yet exquisite charm to one’s stay. And perhaps that’s why I felt so connected to Leslie and Jess – it was really cool seeing them live out their dream, and one that I had forgotten that I even had! Oh! Before I forget! Here’s the listing on Airbnb and a link to their Facebook page! Feel free to contact me anytime with questions about our stay! Previous Post Ty Baby: Double Digits!